Each year certain MLB players rise to the top of the league in power hitting, batting average and RBIs; but few have the ability to dominate “The Bigs” year after year. What makes the members of the 500 Home Run Club® so remarkable is they each maintained their batting skills at the highest level for 15 to 20 years, or even longer. This despite the fact they faced some of the greatest pitchers the game has ever seen; each of whom was intent on shutting them down with their nastiest pitches, trickiest strategies and greatest concentration. After all, nobody wants to be remembered as the guy who gave up someone’s 500th Home Run…but everyone wants to be one of the guys who hit 500 career long balls! So it’s no surprise that active players seek out the advice of 500 Home Run Club members (by phone, over dinner or any other way they can get a few minutes to talk). And it only makes sense that teams looking to amp up their hitting attack would pull out all the stops to bring in these prestigious power hitters to coach their up ‘n coming hitting stars. 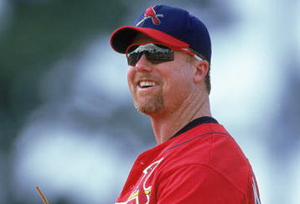 The St. Louis Cardinals organization recently honored team tradition and bolstered their chances of dominating at the plate next season by hiring 12-time All-Star Mark McGwire as their hitting coach. 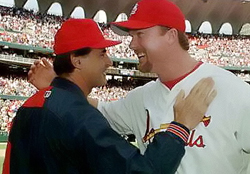 One of the main reasons “Big Mac” agreed to take the job was due to his longtime friendship with Cardinals skipper Tony La Russa who’s been close with McGwire since managing him both in Oakland and St. Louis. "Tony (La Russa) thinks he'll be a great coach, and I think he's got a lot to offer us in terms of tradition and commitment to success," said team chairman Bill DeWitt Jr. "Mark is passionate about the game, passionate about the Cardinals,"
Big Mac played 4 1/2 seasons with St. Louis, in which he hit 220 of his 583 career home runs and briefly set the MLB single-season record with his 70 homers in 1998. But what’s so impressive is he finished his career with a .263 batting average and was among the team leader in OPS (on-base plus slugging percentage). McGwire has been invited as a Spring Training instructor by the Cards several times in the past few years, but has rejected these invitations. He did work with St. Louis outfielder Skip Schumaker and free-agent Matt Holliday last winter, so the Cardinals know he has the ability to help young players correct batting flaws and make the most of each opportunity at the plate. Among the celebration in the New York Yankees clubhouse after their recent World Series victory, observers saw one of the most recognizable faces in baseball history, with a big smile of satisfaction on his face: “Mr. October” himself, Reggie Jackson. Despite having Philadelphia’s Chase Utley tie his record with five homers in a World Series, Jackson reveled in seeing his Yankees play so well in the post season, and is proud to have played in role in bringing another Championship to New York. “I don’t mind that he (Utley) matched my (World Series) mark because we won. I'm good to go with that,” Jackson said. As far as advice for the newest World Champion New York Yankees sluggers, Jackson said: “I urged them to enjoy the experience as players on a team that won it all together, because you never know if it'll happen again." So precisely what has Reggie been doing in his role as “special advisor” to help the Yankees not simply make it to the post season, but win it all. “I talk baseball with the young guys and help them to realize how things are different this time of year,” said Jackson, who shakes hands with VIPs and fans alike, and carries himself as someone who has gone all the way before because, of course, he has FIVE TIMES! 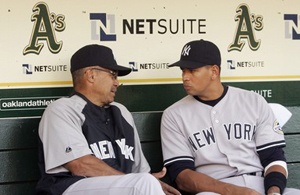 He led the 1972, 1973, and 1974 Oakland Athletics team to back-to-back-to-back World Series titles and then switched coasts to anchor the 1977 and 1978 New York Yankees that won it all for the Pinstripe nation. During his 19 storied seasons with the Chicago Cubs, “Mr. Cub”® Ernie Banks (512 career HRs) was known as much for his love of the game as for his smooth swing and his Gold Glove fielding skills. 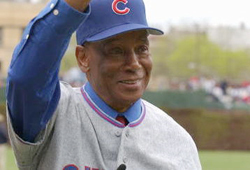 Nowadays the two-time MVP and 14-time All-Star, who brought smiles to Cubs fans regardless of their win-loss record with the simple phrase “Let’s Play Two”, serves as an Ambassador for Chicago north-siders and a elder statesman for U.S. baseball as a whole.